Rune Factory: Frontier for the Nintendo Wii is the big brother version of the series originally started on the Nintendo DS. Once again, you play the part of an amnesia character set to take up residence on an abandoned farm to cultivate your crops, befriend your neighbors, fight and befriend monsters and explore the new frontier dungeons. Once again Mist helps you start out by giving you a new homestead. You arrive in the town of Trampoli while chasing Mist, the girl that sets you up on your first farm in the DS Rune Factory. She has had strange dreams that have brought her to this town and with you here now, she hopes that the two of you can solve the mystery of the dreams. Part of these dreams deal with the unusual Whale Island, a magical floating island above the town that has sentience. It asks you to aid it before it loses itself and becomes quite. As before you are given a rundown farm and homestead to make do with and convert it into a bountiful farmland. While growing and tending to your land, you also will interact extensively with the villagers of Trampoli. As with the DS version, there are several people in the town running the local businesses, such as the general store, church, clinic, inn, hot springs and blacksmith. There are also characters from the DS version that come to live in Trampoli for your game duration, such as Rosetta and Melody. Character interaction is a must if you want to progress through the game’s story. Meeting with the newest villager to move to Trampoli in the clock tower. 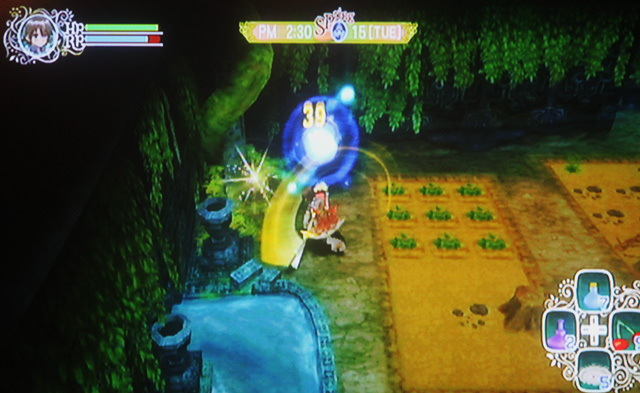 The third-person combat returns, having you delve into a number of ruins in the surrounding area as well as the dungeon complex located on Whale Island. Here is what makes Rune Factory the ‘Fantasy Harvest Moon’ by letting you combat monsters and outfit your character for battles alongside cultivating your crops. You will delve into these ruins in search of treasures and monsters. Monsters can also be befriended to use on your farm or in combat. The crafting system is also back and has been revamped, allowing you to create your own meals, weapons, medicines and accessories. While being of a similar nature of the DS version, the tweaks received in this game for the Wii make it an enjoyable experience. 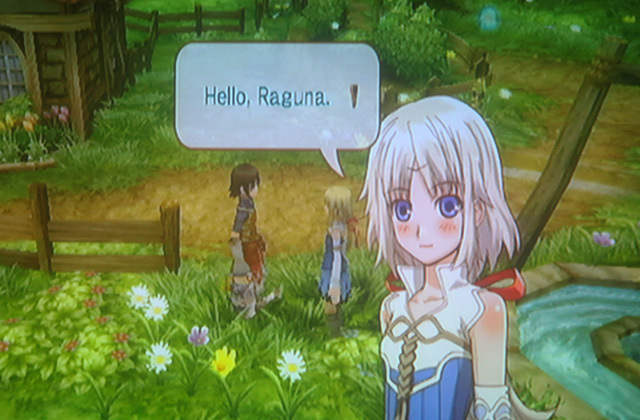 The character for Rune Factory: Frontier is played in third-person throughout the entire game. The camera is also fixed, not allowing you to change its position. While this may seem unsettling at first, the game is displayed in an isometric view allowing the surrounding areas to be seen clearly and do not distract from playing. The wii-mote and nunchuck setup is used with limited waggle controls which consists you shaking the wii-mote instead of hitting the A button to use your equipped item. The game states that if desired, the classic controller could be used instead of the wii-mote and nunchuck setup. It does take a little bit of time to get use to using the analog stick to control your character, but once done it feels very fluid and nicer than using a d-pad. Your tool/weapon selection for quick and easy access. The other problem though that has plagued the 3D versions of Harvest Moon is aligning yourself properly to tend to your crops. Rune Factory: Frontier makes use of a crosshair that can be locked by depressing the Z button, allowing you to shift a square at a time and be locked to it. This allows for more accurate control as actions are done through the A button and harvesting/pickup is done with the B button. You are also allowed to set up a tool and useable item ‘hotkeys so to speak. 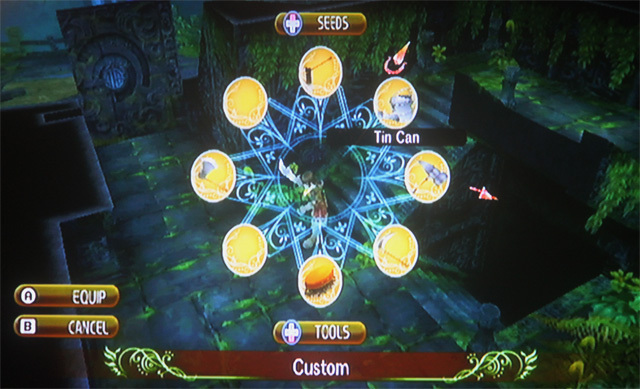 The '-' button on the wii-mote lets you access the custom tool/weapon setup while the directional pad sets up the useable items. This is a very nice addition to quickly access your items without having to go into your main menu all the time. Setting up to grow turnips on your farm. Growing your crops is done in traditional style: till your soil, plant your seeds, water and then harvest. You are allowed a limited amount of energy called rune points to perform your ‘A’ button actions. This beats the ‘how much energy do I have’ game of Harvest Moon farming. With repeated use of tools and weapons, you can increase your experience in them and lower the rune point cost to use them. 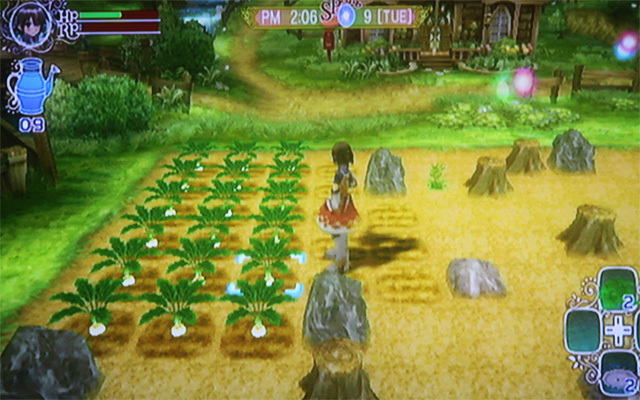 Rune Factory allows you to plant all 9 seeds in a 3x3 square since you are allowed to walk over your plants, a much desired addition over older versions of Harvest Moon. You also grow crops inside the ruins you explore to be able to generate the rune crystals that replenish your rune points and allow you to continue on in the ruins. While in the ruins you will fight your way through a number of enemies and their generation portals. To cease the enemies from continuously appearing, the portals must be destroyed. Combat doesn’t have a lot of finesse beyond swing and dodge. As you get more proficient with your chosen weapon it makes the hack ’n slash even easier as enemies can be destroyed in a swing or two. 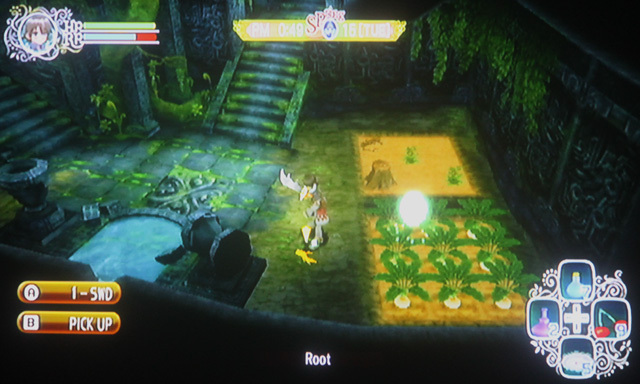 Fighting enemies in the Green Ruins next to planted crops. Beyond the ruins, there is also the town of Trampoli and her residents to interact with. 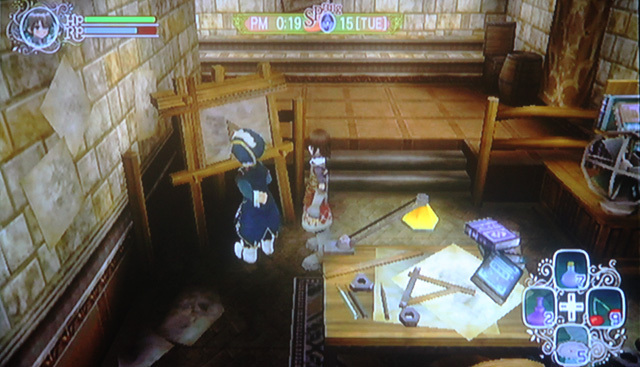 As with previous installments of Harvest Moon and the first Rune Factory, character interaction is important, so important that if you don’t talk to nearly all the characters in a particular sequence the second day; none of the shops will be open for business till after it’s completed. Thankfully, the characters all have their own unique personalities and schedules, so interacting with them isn’t a chore. Each villager has an illustrated graphic and voice dialogue, even when talking with them in normal day to day activities. While the Wii isn’t the graphical powerhouse the PS3 and XBOX 360 are, the graphics are befitting and visually lush for Rune Factory: Frontier. It would be unfair to compare it to the DS version, but the environment visuals are much easier on the eyes than its predeccesor. As mentioned befo Illustrated graphics showing both your character and the local villagers.re the graphics are lush and vibrant adding a fantastical storybook feel to the game. The game area is a bit restricted though, with limited allowed paths and areas to be explored. Getting lost shouldn’t be a problem with the limited locals as well as having a handy map under the ‘2’ button. Each character has its own unique illustrated graphic that appears when you are talking with them, having dialogue bubbles as well as voice from time to time. The character’s mood will also change within the graphic giving a clear indication of how they are feeling. There are also animated cut scenes throughout the store showing off new characters or new situations that happen around your character. Each is animated fluidly and includes a re-watch option from the main menu. 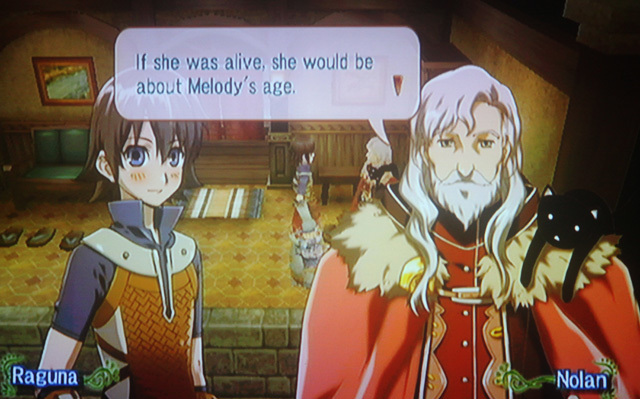 The music and sound are befitting of Rune Factory, but are not much else to write home about. While the music is fitting it is often forgettable as it is often a repeating loop with different scores for your homestead, Trampoli and the different ruins. While not thoroughly remember able, it is fitting for the game ambiance so you won’t be using the TV mute. A nice extra touch is the tool sounds coming through the wii-mote as they are being used. The big brother version to the DS Rune Factory has been an enjoyable play. While it does have a weak excuse for you being in the town area with some of the reoccurring characters from the first DS game, its full 3D treatment feels nice on the television screen. For those who have already played Harvest Moon games, you will find something new here with the combat and more robust crafting system. For those of you who have played the DS Rune Factory, the territory will feel familiar with a few new twists. The graphics are an upgrade from the DS version and there have been slight tweaks to things such as tool customization, farming and crafting that make the experience more fluid and enjoyable to play. As with other Harvest Moon and Rune Factory titles, there will be repetition to tending your crops, but the villager interaction and ruins give respite to the solidarity of farming. The open-endness of the game also lets you act at the pace you wish while playing the game, but at times direction on what to do next if vague and you might end up wallowing around on what to do next. Making your way through the Green Ruins. Overall I’ve enjoyed my time in the world of Rune Factory: Frontier and hope to continue as such. I recommend the game for those who’ve enjoyed Harvest Moon or have been thinking of trying a Rune Factory. It’s priced at around $20 so it’s worth the buy if you can get your hands on it, but if you are looking for a portable version then the DS Rune Factory is worth the $20 price tag it boasts as well. Disclaimer: All game images are copyright of thier respected owners and taken by members of The Gameslave.